Tired of slow hair growth? Trying to grow out a short cut? Stimulate your hair growth rate by trimming your hair during high energy days. Each month, there are certain high energy days based on the position of the moon, in which hair growth is optimal. For healthy hair you should have a regular trim schedule. The Coily Queens regimen recommends trimming every 4th month, this equals 3 time a year. It only takes one new moon trim to stimulate your hair growth rate, this is not something you must do each month. FOR MORE INFORMATION ON NEW MOON PHASE TRIMMING, GO HERE. 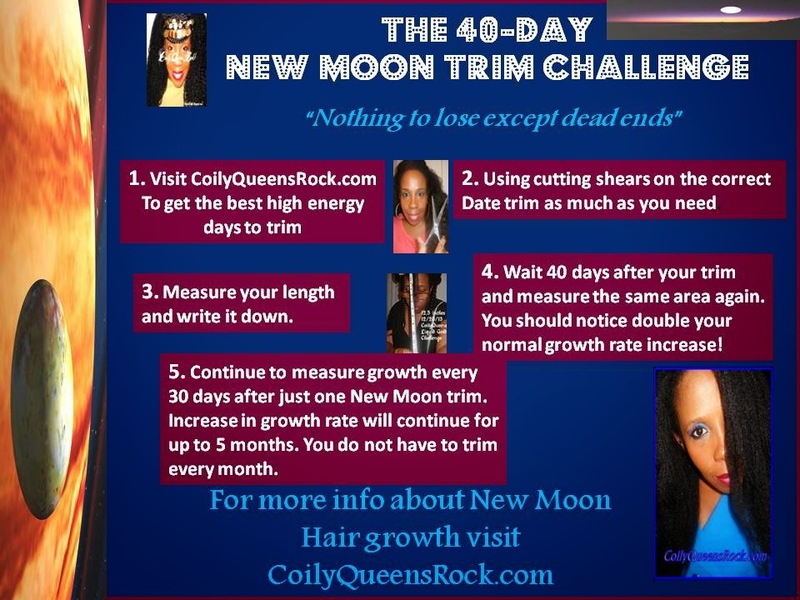 DO A 40 DAY NEW MOON TRIM CHALLENGE, HERE. Also use the new moon phase to start a new hair treatment. Getting ready to take a new hair vitamin? Start taking them on a high energy day. Try new moon phase trimming when it is time for your next trim. All you have are dead ends to lose. Yes this is for 2015. You are welcome and thanks for the compliment. Blessings! How much is an acceptable amount to trim? I'm kinda iffy about whether or not the amount I take off is enough to bring about reasonable results. Start with 1/4 of an inch trim. Sorry to ask, you mean a I'm natural professional or any hair type professional? I want to do it right. Thanks for replying. I need help singing into your contest.